Super Smash Bros. for Wii U is a little over a week away in North America — spare a thought for those of us that are waiting longer in PAL regions and Japan — and a number of Wii U owners are no doubt awaiting their pre-orders or even pre-downloads. Nintendo's stepping up marketing, particularly in North America, through conventional ads and likely having a hand in celebrity tweets. Retailers are doing their bit too, and GameStop is following up what now seems to be a co-ordinated 'event' with a 10-year old thrashing all-comers with a series of preview events this Friday (14th November) around the US. As you can see in the banner the events will run from 6-9pm local time — to check stores running these sessions you can visit the dedicated page. Some are also commenting around the web that their local stores are planning midnight launches for the brawler in addition to Pokémon Omega Ruby & Alpha Sapphire, but that's not yet — at the time of writing — confirmed as a nationwide policy. Are you planning to head to your local GameStop for some Smash Bros. action? Let us know. The nearest stores running the event are over 60 miles away from me. Eh, the game is coming out next week, so I can wait. (Also, I really don't like GameStop). Luckily my friend grabbed me a Diancie card. Like i said on another article, the promotional events are fine, but the fact that they do not release the demo to the public is beyond me. That would probably go a long way in marketing the game. YES! I have a store 11 miles away from me holding an event! I'll definitely have to swing by and play SSB4! Midnight launch at my Gamestop in Ohio! They could release a demo after release. I think it has something to do with marketing and Nintendo's marketing partners. 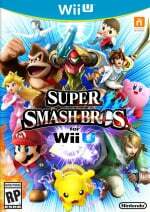 For Wii U owners: Who would go to GameStop or Best Buy if they can play a demo on their homes? Yeah, I think I it's about marketing stuff. The nearest store running this event is about an hour and a half away. It's not worth it to me. I hear what your saying, get the people out in numbers so that the game could be displayed in public. But i think that a better approach would have been to release a demo in the eshop, so that more people could get the hands on feel, while simultaneously have tournaments as promotional events with the same demo, with prizes and give aways to draw people out. While Nintendo will benefit the most, Nintendo should find the middle ground and offer some of this "benefit" to the stores. I think not releasing a demo to the public is at the request of these stores. I'm just guessing. Ugh, there's one in Easley. That's not at all far from Greenville, but does it have to happen on the weekend of my brother's wedding? Not like I can just lie and call out sick for that. Of course. When I visit the page is says, "No participating stores within a 100 mile radius." Typical Nintendo/GameStop. So do we not get anything like this in the UK? We are waiting longer for it to release over here so makes sense to have some kind of demo available for us doesn't it? I hate living in WV. Hooray. The one in Huntsville happens to be the farther away of the three Gamestops.. Oh well.. It'll be worth the drive!! Glad to see them doing this a week in advance, the midnight opening was expected. Still on the fence between Day 1 and BF offerings. And I'm probably one of the biggest proponents of getting demo's on the Wii U eShop, but I'm not sure it's necessary for any game beginning w/ the 3 letters SSB. I'm not opposed but I'ld rather see a Captain Toad demo. Though if they released a demo day 1 w/ amiibo support I do think that could go a long way towards promoting the amiibo to give people a chance to see what amiibo do. But it's the amiibo that need the demo, not any SSB game. If a free demo means a few people buy amiibo just to try them out before buying the game and more amiibo that's still money in Nintnedo's pocket. The limited amiibo interaction in MK8 and HW won't sell a lot of amiibo w/o SSB. Dedicated site claims 20 miles (in Los Angeles rush hour traffic), about an hour away by auto... Oh this'll be fun! Street pass FTW! I'd go for the streetpasses. But they don't have them at enough locations as only two are hosting within a 100 mile radius here in Indiana. Sick of all of these teases lol, they should just release a demo to hold us over for next week. It is at the exact time my high school play will have its first performance. And if you don't have that game you are just wasting your Wii U and Toad won't change your mind. @Genesaur You live in Greenville? I'm from Greenville. I'm currently in Columbia because of college but live in Greenville during the summer. Didn't know any Greenville natives that are Nintendo fans lol. @sinalefa - Thing is, from what I've seen of the vids, the levels are lot more expansive and varied in CPTT then they were in SM3DW. So rather than just say "we already played this in SM3DW we don't need a demo" I think the game actually does need a demo to show off how this is more of a game and less a series a non-connected levels. The demo could have 3 levels, 1 w/ the FPS minecart, 1 w/ the boss and the first level when Toadete gets captured. I think seeing all that laid out on the world map will get people to think - "you know what, this is a real game, it's not just a few levels from Mario". But I'm guessing you already knew that and were just making a joke. But I replied just in case. The minecart level would be perfect for a demo because of its freshness. Same with bosses. The rest is just expanding on existing ideas. And I think this one is like pages on a storybook as opposed to a world map? @sinalefa - "And I think this one is like pages on a storybook as opposed to a world map?" Well that would explain why I couldn't find a vid or photo of a world map. I knew about the book - it's similar to the original Spyro games - but I thought those pages were to keep track of your collectables but you still moved on a map like SM3DW. Too bad, I have a thing for maps. For PS1 games Spyro really holds up well. Open world, voiced, collectibles, power-ups, platforming, fighting. It's surprising I play any 2D games. Wow, this is the absolute worst time for me. Guess I can't go then. It's all good I will just simply wait for the game's release seeing as I already have the game through the pre download system waiting for me! Only 8 miles away... I can make it! GameStop sells Wii U games? You couldn't tell by their adverts. WARNING! I just called the Ripley WV gamestop and this map lied. They aren't doing it. They lied!! The map was wrong in my case. There was no wii u smash there. Beware, people! Fortunately I called before heading out (Los Angeles traffic will do that to you...), I had a good time! (I am an old stick in the mud, if someone cuts me off or I have no cell reception, my day is ruined) the staff at GameStop was considerate and friendly (not too uncommon in my experience, as I have 3 within a 5 mile area) and the free swag they gave out was pretty nifty! Smash stickers and buttons, along with Mario Kart 8 Flags (not cheap either!) lanyards and key fobs! I played little Mac and found him to play regular - nothing overpowered or unbalanced that I could see (I lost second, my wife first), and both my wife and I played little Mac... Fun! I went, beat a buncha jokahs with my Shulk. Also got to run off with some awesome free stuff (tote bag, two pins, a third set of the stickers they keep handing me at Smash events, a free pass to a local tournament, and the promotional box for Smash that I just asked the guy running it if I could have since they ran out of stuff to give me for winning..). 'Twas a fun evening! @xInsomniax Oh, sure. Not many, I guess. So hard to get a StreetPass, 'round here. And I'm the only person I know in town who has a Wii U. But I guess that's true for a lot of people, not just SC.